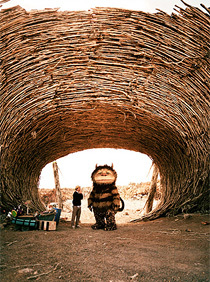 Did a bunch of movie bloggers save Where the Wild Things Are? That's the headline I was going to use when I first started reading this phenomenal NY Times profile on Spike Jonze; but as I read through all 7 pages of it, some of which talk about his childhood and the early part of his professional life, I realized it was much more of an inspirational piece about a true auteur than it was about bloggers saving a movie. Where the Wild Things Are is one of my most anticipated movies left this year, and I'm not alone, as a lot of my friends and colleagues are just as excited for it. However, its been a long time in the making - 6 years in fact. More than a year and a half ago, in February of 2008, a story broke about Where the Wild Things Are being potentially "entirely reshot" because Warner Brothers was unhappy with complaints they were receiving test screenings. The article I wrote on the issue - found here - is actually referenced in the first page of that NY Times piece, along with SlashFilm's article as well. At the time I didn't think 25 comments crying out for Warner Brothers not to screw up this masterpiece-in-the-making would make a difference, but maybe they did after all? But their profile on Jonze is much more about the magic that happened behind the scenes. The blogs that reported on Jonze’s disagreement with Robinov and other Warner executives tended to frame the dispute in familiar terms, as a conflict between Hollywood’s love of all things light and an auteur's "dark" vision. Really, though, the quarrel was about something more unusual in Hollywood than darkness versus light, something more central to Jonze’s identity: the question of plot versus attitude. Hopefully by now you've seen the trailer, watched the featurette, and familiarized yourself with all things Wild Things. Part of the reason why I think it looks so wonderful is that it looks like it will be taking the audience right back to their childhood - which is exactly what Spike Jonze wanted. "Jonze told me that one of his models for the dialogue was the work of John Cassavetes, which may be exciting news if you're a fan of avant-garde cinema, but might not sound quite as good if you’re the president of Warner Brothers." Or take this quote from Spike: "There is no difference between childhood and adulthood." After seeing a rough cut a year ago, NY Times' writer Saki Knafo told Spike that it wasn't anything like what he was expecting. He looked at me as if I’d let him down. "It's in the visual language of, like, some sort of fantasy film, and it is a fantasy film to some degree," he acknowledged, “but the tone of it is its own tone. We wanted it all to feel true to a 9-year-old and not have some big movie speech where a 9-year-old is suddenly reciting the wisdom of the sage." He hadn't set out to make a children's movie, he said, so much as to accurately depict childhood. "Everything we did, all the decisions that we made, were to try to capture the feeling of what it is to be 9." I'm trying to give you a small taste of the brilliance found in this article (just go read it). It's one of the best profiles I've ever read and one of the most inspiring - and I'm not just saying that because we're mentioned in it. It also mentions a lot of the movies that inspired Spike before or while working on Wild Things, like "The Black Stallion, E.T. and The Red Balloon, along with various dirt-bike and skateboard videos." Or when he was writing the script with Dave Eggers: "The two of them wrote in Jonze’s house. For inspiration, they'd watch The Wizard of Oz." That's one of the quintessential movies that anyone of any age can enjoy. So when the lights dim in the theater on October 16th and Where the Wild Things Are begins to play, I hope you'll think back to everything that this had to go through to end up on the screen in front of you. The first place to start is with Maurice Sendak's book itself, then the NY Times profile, and then, maybe, back to this site, where you can look at all that we went through fighting to make sure Spike's vision was intact. Indeed, we're just a very small piece of the puzzle, but the full story is great to hear in its entirety. And I couldn't be more excited to finally get to see Where the Wild Things Are in October. Let the wild rumpus begin! :).i can't wait for this to come out! yeah, it's a great article. I've been in love with this movie since I first saw the trailer for it. I don't know how many times I re-watched it since then, but I still get all emo and can't contain a lip quiver, lol. I won't deny, tho, that the song in the trailer is a huuuuge factor in that. I hope the movie will still be as touching and wonderful, and leave me with a cozy childhood feeling a la Neverending Story when I watch it at the theater. I can't wait! Very interesting. I am now even more excited for the movie. i think this will be my favorite movie of the year...just like wall-e was my favorite film last year! im such a sucker for visionary children's movies and #4, i think that we are all gonna get that cozy feeling with this film... i already get it from the trailers! Did you just try to take credit for saving Spike Jonze's movie? Jesus Harold Christ on a bike. Thanks for the link to he NY article. Your daily email always has relevant information that does seem to be the best information concerning film. #8 - Uh, no if you read this and the NY Times piece (which mentions us), I'm saying maybe we had an effect, a small one if anything... But really, it's just a fascinating story about Spike and how this movie came together, not that I'm taking any credit.